DALLAS-Neither rain, sleet, snow or dark of night could keep cadets of the southwest regional winter encampment of the Civil Air Patrol from appearing for their graduation muster. Temperatures were in the mid thirties for graduation day. The same bone chilling temperatures that became part of the every day routine cadets had to look forward to each morning. The traditional “Pass in Review” was cancelled because of the inclement weather. In addition to learning the courtesies and customs of the service, cadets are brought up to date on career opportunities in the military and civil aviation. The cadets are also exposed to drug deterrent programs which were conducted by Chaplin Lt Col Gordon Rourk. There were over 250 cadets and senior members who participated in the encampment. CSr/A Ahmed Ghuznavi of Foxtrot flight was named “Honor Cadet of the 77th TCTS of the encampment. Foxtrot flight was also named winner of the unit Drill competition and selected as outstanding “Warrior Flight”. 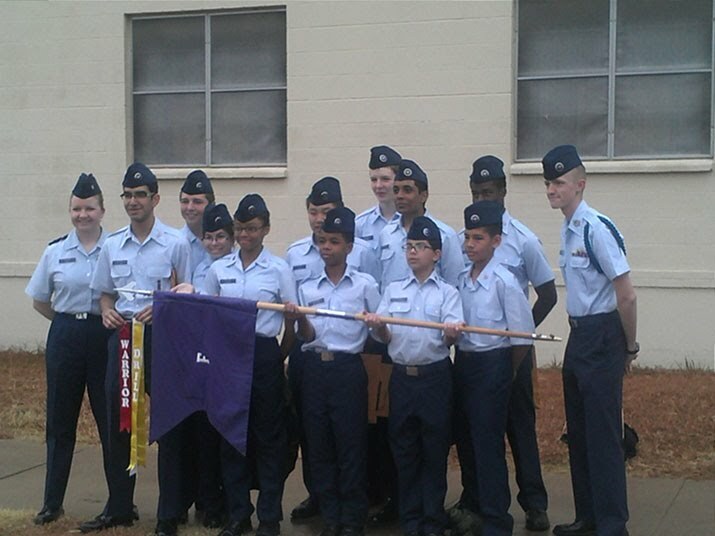 CSr/A Ahmed Ghuznavi is a member of Group III, 391st Composite Squadron based at Dallas Love Field. Lt Col Bob Sides, 391st Squadron Commander, noted “he was most gratified by the selection of CSr/A Ghuznavi as outstanding cadet, as he extended his and the squadrons congratulations for a job well done”. Lt Col Russell Miller exclaimed “ Great Job Airman Ghuznavi. Thank you for representing Group III in a most positive manner”. The Texas Wing of Civil Air Patrol, is commanded by Colonel Brooks Cima. AFRCC with saving 54 lives in fiscal year 2011. Its’ volunteers also perform Homeland Security, disaster relief and drug interdiction missions at the request of federal, state and local agencies to nearly 27,000 young people currently participating in the CAP cadet programs. Chosen "Honor Cadet" C/Sr Airman Ahmed Ghuznavi proudly displays Foxtrot Flight colors for best Drill Flight and Warrior Flight Awards.